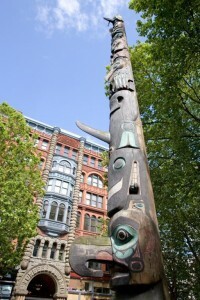 For group planners developing Pacific Northwest itineraries, Seattle is a staple. Conveniently, many of the main sights are in, or right outside of, downtown. The central waterfront on Alaskan Way, a pierside promenade within walking distance of downtown shops and hotels, is awash in seafood restaurants and gift shops. Feast on the fresh catch and views of Elliott Bay from the outdoor patio of Fisherman’s or enjoy a bowl of clam chowder at Ivar’s Acres of Clams. Other dining choices include Elliott’s Oyster House, Anthony’s and The Crab Pot. Or just grab some greasy fish and chips from one of the sidewalk vendors. Seattle Aquarium, built atop Pier 59, is one of the waterfront’s star tourist attractions. Playful otters provide entertainment, and colorful schools of fish intrigue visitors at the Underwater Dome and 40-foot-wide viewing window. Touch pools invite guests to make friends with anemones and starfish. The new Seattle Great Wheel offers 15-minute rides in six-passenger enclosed gondolas that rise 200 feet above Pier 57. At the north end of the downtown waterfront, Olympic Sculpture Park is one of the best free attractions in Seattle. 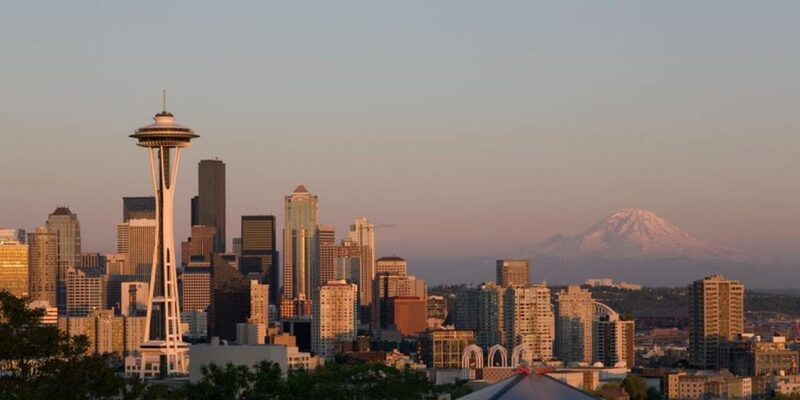 Argosy Cruises offers one-hour harbor excursions that provide an ideal orientation to Seattle. Besides panoramic views of the downtown skyline, passengers get closeup looks at gantry cranes loading and unloading container ships. Snow-capped mountains loom in the distance, providing great backdrops for the freighters, ferry boats and pleasure boats crisscrossing Elliott Bay. Argosy’s “Tillicum Village Tour” to Blake Island, across Puget Sound, features a salmon bake and Northwest Coast Indian show. For those who don’t mind venturing into the open air, the Space Needle offers an outdoor platform with telescopes. Indoors, touch-screen kiosks focus on aspects of Seattle today, with short video presentations by local citizens discussing such topics as coffee shops, microbreweries and the current music scene. Just below the observation deck, SkyCity revolving restaurant makes a full revolution every 47 minutes. The Space Needle is the focal point of Seattle Center, a 74-acre urban park with museums, theaters, festival venues and family-style amusements on the site of the 1962 fairgrounds. 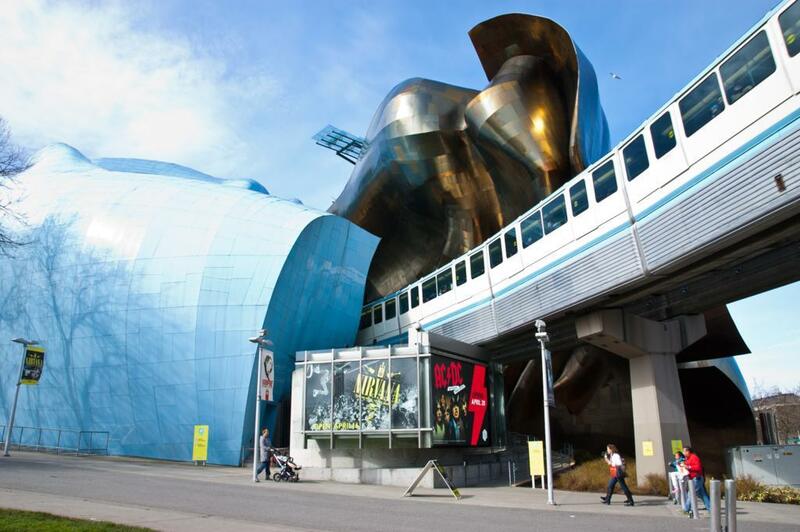 The Pacific Science Center, with hands-on learning stations, laser light shows, a planetarium, butterfly house and two IMAX theaters, occupies the former U.S. Science Pavilion. Chihuly Garden and Glass, which opened last year at the base of the Space Needle, showcases the most comprehensive collection of Washington native Dale Chihuly’s fanciful, color-saturated glass art. Pike Place Market, one of America’s oldest farmers markets, lies just minutes from downtown’s Pine Street retail core. Dating from 1907, the historic expanse of stalls, kiosks and shops invites visitors to browse, eat, take pictures, listen to street musicians and just soak in the festive atmosphere. Called the “soul of Seattle,” it’s a true urban gathering place. A short but steep hike from the waterfront, Pike Place Market, is, above all, a food bazaar. Seattleites appreciate ethnic cuisine and prize the Pacific Northwest bounty of fruits and vegetables, seafood, and artisan cheeses and baked goods. Curiosity-seekers congregate at Pike Place Fish Market to wait for “flying fish.” Well, the fish may not have wings, but when someone orders a whole king salmon, a fishmonger in coveralls and rubber boots removes it from the mound of ice and tosses it to the counter attendant, calling out the order in a time-honored ritual. Other must stops at the market include Daily Dozen Doughnuts, known for oily, piping-hot mini-donuts covered in powdered sugar; MarketSpice, famed for its signature cinnamon-orange-clove tea; Piroshky Piroshky, a tiny bakery that turns out Russian pastries filled with meat, cheese and sweets; and Chukar Cherries (dried-cherry confections). And make a pilgrimage to the first store in the Seattle-based Starbucks chain, which opened at the market in 1971. Also downtown is the Seattle Art Museum. Highlights include the Northwest Coast Indian and African collections, contemporary works by Jackson Pollock and Andy Warhol, and European masterpieces. Pioneer Square Historic District, on the southern fringe of downtown and a block from the waterfront, is the best place to commune with Seattle’s past. Stately stone commercial buildings, many with cast-iron pillars and Richardsonian Romanesque arches, arose in the early 1890s, soon after this former downtown area burned to the ground. Today these architectural treasures—with their lofty, beamed ceilings, exposed brick walls and creaky wooden floors—house art galleries, antique shops, bookstores and cozy eateries. Pioneer Square’s early days come alive on Bill Speidel’s Underground Tour, an irreverent walking tour that starts with a 20-minute history lesson and then heads below street level. Through subterranean passageways littered with old pipes, loose masonry and other debris, tour members see abandoned storefronts on sidewalks that were entombed when the city elevated streets a full story to fix a chronic sewage problem. With so much going on in Seattle’s city center—from museums and markets to gardens and waterfront diversions—one could easily design a three- or four-day tour that never sets foot anywhere else in the metro area.